And I wonder why I keep coming back here...! Yesterday was the Starkbierfest celebration in the Augustiner-Kellar here in Munich. We met at what felt like an early 1pm with some apprehension of that first Starkbier so 'early' in the day (at least it looks like coffee!). The fest started low-key as we filled our stomachs with Schweinebraten and cautiously sipped our first Starkbier, but the crowd continued to get larger and more festive with Schuhplatter dancers and the band adding to the atmosphere. 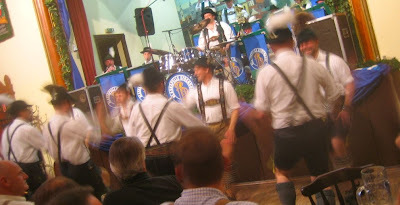 Most of us switched to Helles beer after the first Starkbier so as not to overdo it, and the day rolled into high gear as the band moved to more schlager type songs that everyone would sing along and dance to. Eventually it had to end, but I was glad that many of my friends were not done either, so we took a tram to the Edelheiss, which thankfully was playing videos of schlager hits for the enthusiastic crowd to sing with. 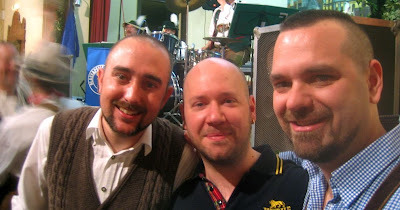 But that of course couldn't go on forever either, and another Munich celebration was one for the photo books.